This Australian mix of thriller and message movie has some interesting ideas but the end result is less than the sum of its individual parts. The big problems with The Chain Reaction lie in its script: the narrative meanders, wasting too much time on uninteresting character moments when it should be tightening up its plot, and the actual thrill-oriented part of its plot takes far too long to get going. This is a shame because the performances are solid across the board: Steve Bisley and Arna-Maria Winchester are likeable as the couple caught in the middle of political machinations and Hugh Keays-Byrne has a scene-stealing role as a political protestor who shows up at the right moment to give the hero some much-needed information. It's also worth noting there is a blink-and-you'll-miss-it cameo by Mel Gibson for the eagle-eyed viewer to enjoy. On the plus side, the film boasts a couple of well-crafted car chases but even those moments can't make up for the slack storyline. 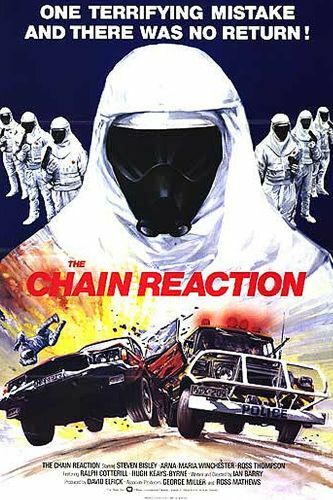 In short, The Chain Reaction feels more like a missed opportunity than a quality thriller.